But I'm feeling much better today so will be going to the Auckland Knitting Group tonight. I still have a sore throat and I hope I don't infect everyone there! I've been working on a blanket, but I haven't done anything with it for a couple of weeks so I really need to get going with it again. 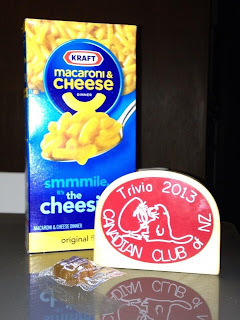 So, Kane and I headed out to the Canada Day quiz at the Clare Inn yesterday run by the Canadian Club of New Zealand ready to test of Canadian knowledge and meet some cool people. We arrived and already there were plenty of people there having some food and chatting in groups. I introduced myself to Cary Young, the club president and he was very welcoming and friendly. We got a couple of drinks and then chatted with a nice couple, Erika and Graeme. Amusingly, it turned out that Graemeis Scottish and moved to NZ a while back. Erika was quiz mistress of the night so we found ourselves a team and tried to answer some questions. I was pretty happy that my studying had paid off and I was able to answer some questions and Kane was happy that he remembered the name of the explorer John Cabot and got 10 points for that bonus question. In the end our team came third and we won a goody bag from Marthas Backyard and an awesome trophy.